During the auctions I’ll call, Going once… Going twice… Going three times… during which time, any new bids will reset the count. IIIIIIT’S AUCTION TIME!!! WHAT THE HECK AUCTION!! Lot 1 – Errr, can I have some Indian Rare Pepes please? La mas chingona soy yo! If you’ve just joined, we’re on Lot 1 – Errr, can I have some Indian Rare Pepes please? Okay… I’m calling Going Once now..
you bidding against yourself Psy? Lot 2 – It’s Pepe Time! Inspect. PEPETIME. Fine, dank rare. Who else doesn’t have a PEPETIME yet? Very fine, dank Pepe. Plus Glen’s great art as well. how many tajpepe are there? Was it you? too much happening! Are we ready to roll again? Lot 3 – Killary me softly with her death stare. is it too late to add my card to one of the lots? > is it too late to add my card to one of the lots? can I see the lots somewhere ? or only in this chat? Lot 4 – It aint Christmas anymore, Time for Peephole Pepe! how about 20K? Who’s serious for this lot? Card not found. Did you mean PEPEASSANGE or PEPESSANGE ? requests for break? five minutes? let the openers get started..
Can we get listings of the issuances please? okay… where are our serious bids for this Lot? its not litter if combined with bid hey! rule change… there was a bid in that post? 12K? Helene were your 12.5K? Helene can we continue, we’ve both apologised for the error. Bernie’s, Snowden’s, and a NEOPEPE! @sjunaidali did you get that wining bid down? it whole package or just one? Im broke. I pay to play if i want it. Okay… gotta starting calling this..
wait ICQ had bid more no? Lot 7 – The Smooth Haired Beauty of Rare Pepes – Watch Out Mempool! This could get messy… where’s @ShawnLeary ? He’s very fond of HAIRPEPE I recall. okay… how are we all feeling? Seller has place a hidden reserve. okay, no more bids, moved to the back. It can be removed if reserve not met. next Lot is Lot 9. Lot 9 – What, More Hair!!?? Pump and Pump!! And The Last Pepe!!! yes, if reserve not met, the Lot is passed to the back, re-opened once, then removed from auction if reserve not met. Reserves are never public in any auction. reserve not met… seller instructs me not to drop reserve. Alpha bidding required to win this. looks like we’re moving this to the back too… seller will advise whether to open again or not. Lot 10 – “Super Rare” The Power of Morpheus and Zero Wing! Card not found. 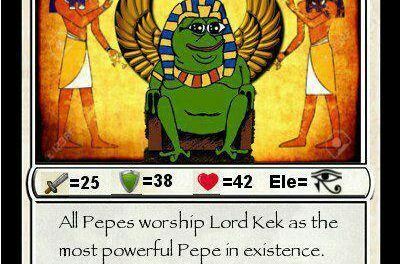 Did you mean ZEROWINGPEPE ? can we open at any price? Reserve met, we’re in a live auction, winner will take these home today. missing 1 at the front? Somebody set us up the bid.
. . . Belong to rare pepe news? > . . . Belong to rare pepe news? Psy, was that a bid or a comment? you wanna own these 1/43, 1/50 or not?? Do I have 10K to start us off? Okay… auction is under way… let’s see how we go. Most dont. These auctions are really some of the last chances to get low prices. As the community grows and Pepecash is adopted more and more each day. As well as 1 of 40 PEPEBRICK, you’ll take home 5/500 RPDF, 1% stake. Check the DEX… RPDF has sold for 10K recently, that’s 50K just there. you can get 20K back just from selling 2 or 3 RPDF’s! I’d bid now if I wasn’t running this. we’re with Eric who’s spending his dental floss money on Rare Pepe.s..
1 of 40. RPDF was just the entre. recap of what is being bid on? going once… will Eric respond? i dont get it, arent they on DEX for 8xcp each? three lots to go… plus Lot 9. In honor of a successful auction. 5 pepebrick will be sacrificed to Lord Kek as a thanks offering. Reducing pepebrick to 35 in existence. its not about the price, its about the win! okay, are we composing ourselves now? @Needmoney90 u sit this one out? Lot 12 – A New Packet of Pepe’s! Card not found. Did you mean SITHLORDPEPE ? OOOH I LOVE THAT SITHLORD !!! What you mean by that ?! Hold on, finalizing my title loan. has everyone confirmed their lines of credit? James, how’s your bewilderment? Did you sell your car yet? Bad Auctioneer. Forgot to advise. There is a reserve. Eric, how’s that mortgage comgin? can I loan some money to myself? back yourself. fortune favours the bold. is that the fork, or the fork of the fork? lmao can we bid SoG cards? does it have a lot of zeros? so be careful if you bid against me. the reserve is a bit far away at this point. okay… we’ve had some banter. alright. I think these are going back into the seller’s hands at this point. what price did you buy your pepecash at? Cost basis is cool. % Gains is cool. Absolute amount of coins is uncool. I’m going to have a quick word with the seller. ICQ where are you on this right now? Got a price in mind? okay… if there are no further bids, I will enter into private negotiations with @Needmoney90 on behalf of the seller. we are not at reserve… well on the way, but not there. Okay. We have a private sale which met the reserve. @NeedMoney90 has donated two outstanding Rare Pepes to help @glen0 recover from the devasting blow he suffered of a theft of his Bitcoin earlier this week. It’s a very generous gesture. until people in the other chat see? We’re doing Lot 9, back from the salon. So bidding needs to start from there… reserve not yet met. People, very important people, told me that it’s future value will be ridiculously fantastic. 14 is donated by @Needmoney90 … seller is entitled to 1 bid. Oh. Not a powerful bid. Okay, we’re three hours in. This is for Glen. Who was robbed this week. As donor of the cards, @Needmoney90 gets two bids. Eric, have you sold your car yet? > Eric, have you sold your car yet? I’m gonna start calling it soon..
By lend, I mean I hold the card in escrow until you pay. so if no other bids… I’m calling three times, final chance. JJ want same loan deal? thats about $600 am i right? All buyers, please send your PEPECASH to the address I will pin shortly. 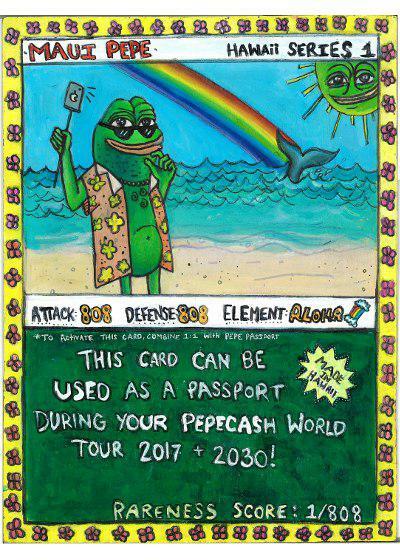 Cards will be sent once your PEPECASH is cleared. @glen0 you do realize what Lot 14 was, right? or sell on the market for your btc? No trolling please Eric, Glen was really upset the other day. Eric, Glen is co-founder and co-Admin here. Please respect the co-founder of WTH Auction House. and remember everybody needmoney donated those cards. @glen0 we’re ahead of the USA time zone and others EU etc. does Friday nights work for most? Because I don’t have any other good options in my week. newcomers are welcome to watch, but its like the tennis Grand Slam. Read Hitchhikers Guide to the Galaxy and message me. Pass my quiz, and you get one for free. Gratis. No charge. Rare Pepe Foundation has established certain standards for this community, we have card creators who are minors… don’t say anything you would’nt say in front of your kids / nephes nieces etc. warm greets and congrats! great event. ha. its OK. no beggin. its fine just being here. I feel the tide. basking in it. it’s a great job you do. lost my clerk 1/3 way into the auction today… like Luke Skywalker when R2D2 gets hit. hey guys are rare pepes divisable? Experience of the Original and Dankest Rare Pepe Auction Master greatly appreciated and respected. Optimisations need to be calculated. Auction rules refined. Please monitor this group and our Channel for updates. did you post the auction results anywhere? I’ve got all the data in my sheet now… working through settlements. will finish all sends in about 8 hours. alrighty, auction results summary posting tomorrow, along with some analysis… transcript will be prepared for Rare Pepe News. @nola1978 I need your receiving address to send you 5 HAIRPEPE and you can send your 7,000 PEPECASH to 19Z3H48VHsmBHBn8EUqm8jrPXUEiPjL4fu. I’m in a work session today, but I’m processing settlements through the next few hours as well. Hey everyone, just had 30 minute break after 5.5 hours corporate work. Getting into sending out the remainder of cards now. Had to wait for some more BTC to hit the Auctioneers Wallet too. Have set TX fee to 0.0003 BTC, hopefully will make getting all your cards out to you somewhat faster than default. Okay everyone, I have now sent out all cards and net seller earnings that I have recorded. Several Lots were sent directly from Sellers to Buyers. I’ve communicated all relevant details between all parties. If I have overlooked anything, please PM me. We achieved a total of 699,500 PEPECASH across 14 Lots yesterday. All listed Lots were sold, including all with Reserves, one through private negotiated settlement. Your participation was greatly appreciated. We are running again next week, same time, same channel. Thank you. Auction Transcript will be posted to www.RarePepeNews.com in the next 24 hours or so.